The Rangers have been a part of the Rick Nash Derby for months now, and it's been especially obvious how much they coveted the winger ever since John Tortorella admitted after the season that the team needed to add a goal scorer, even if said scorer didn't necessarily do all the little things the team is known for. 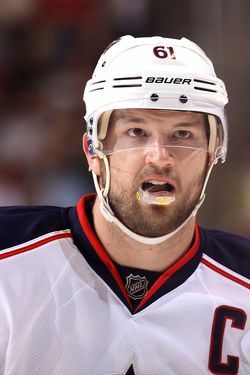 As was pointed out at the time, the player he described, without naming names, was Rick Nash. Building the perfect player in some sort of lab isn't possible, and so the Rangers would instead target the best available option to fill a need. With Columbus all but certain to move their franchise player before the season began, and with Zach Parise showing no interest in crossing the Hudson — Nash was their man. And this afternoon, they landed him. There is a difference though between lusting and sinning, the latter the impulse Sather ultimately resisted by rejecting Howson’s laughable demand the package include Dubinsky — plus either Ryan McDonagh or Michael Del Zotto — plus either Derek Stepan or Carl Hagelin — plus 2009 first-rounder Chris Kreider, the Boston College winger who conceivably could join the Rangers when his college season ends — plus a 2012 first-round selection. Sather knew better than to blow up the team last season to acquire Nash and instead simply waited until Howson's demands dropped. Technically speaking, Howson got close to what he wanted, in that the Blue Jackets will get a pair of NHL-ready forwards, plus a prospect and a pick. But this is still an absolute win for Sather. This is where the Rangers stockpile of assets is so evident: Dubinsky could be a trading chip all this time because they had several other young forwards with reasonable contracts who were either more accomplished, more promising, or simply younger. Erixon has potential, but he's not necessarily the key to their defense going forward: Even with Michael Sauer's future uncertain, they're in good shape with Dan Girardi, McDonagh, and Marc Staal. And while Artem Anisimov is a nice enough player who for a time last year played on a very effective line with Stepan and Marian Gaborik, his season might be best remembered for his gun-fire goal celebration against Tampa Bay. Once Marian Gaborik gets healthy, the Rangers can, in theory, put out a top line with two guys capable of scoring 40 goals, centered by a guy who's hit the 50-assist mark four times. It's a bona fide top line — and an expensive one, to be sure — but the Rangers can afford it thanks to young, relatively low-cost players in other areas. The Rangers had been relatively quiet in the off-season until now, but now they've addressed their biggest need and done so in a splashy way. We know better than to assume that off-season victories will translate into regular-season ones, let alone playoff ones, but this is a big moment in the construction of this roster, not to mention a big moment in the tenure of Sather. Rangers fans once chanted "We don't want you" when Nash skated at Madison Square Garden, in large part because the reported asking price was so high and because the Rangers had no reason to make a panic move. It's not usually a fair to simply ask a sports fan "Should Team X trade for Player Y?" Unless there are money concerns, the terms of any trade make all the difference, and this is a trade Rangers fans should be able to live with: They gave up some pieces including the popular, if frustrating, Dubinsky, but it's worth it for what they're getting in return. Sather didn't panic. He waited. And now he has his man, while keeping many of the pieces so critical to the team going forward. (It's hard to imagine Nash could have been had for much less.) We used to expect the worst from Sather, but that's been changing in recent years. He played this one just right.